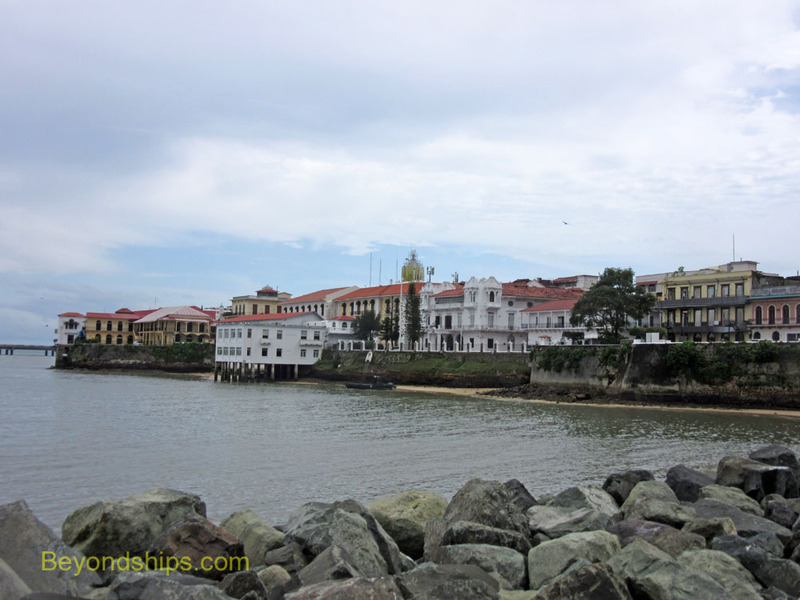 Casco Viejo lies across a bay from the towers of the modern city. As the center of commerce shifted to the modern city, the old colonial city fell on hard times. However, in recent years, an effort has been made to rescue the area. As a result, the area has become a popular tourist attraction. Overall, the area is reminiscent of Old San Juan in Puerto Rico. The narrow streets are adorned with Spanish colonial architecture and open out into plazas with churches and other public buildings. It has not been developed to the same extent as Old San Juan and so is not as lively but it seemed clean and peaceful. The first landmark that our guide pointed out to us was the Presidential Palace or Palacio de Las Garzas. Dating from 1673, the building was the residence of the Spanish governors. It later became a winery, a school, a customs house and a bank until assuming its current role as the official residence of Panama's Presidents and headquarters of the executive branch in 1855. The building was extensively re-modeled in 1922. Its name comes from the African herons who live in the courtyard. After walking through the narrow streets, we came to Independence Plaza (Plaza de la Independencia). Panama declared its independence from Columbia here in 1903. The Plaza is dominated by the Metropolitan Cathedral, construction of which began in 1674 and went on for a century. One of the largest cathedrals in Central America, its two towers are encrusted with Mother of Pearl. It was restored at a cost of $4 million in 2003 and is an interesting example of Spanish colonial architecture. Also in the Plaza is the Panama Canal Museum. This is housed in a building that was once the Grand Hotel. It dates from 1874 and was the headquarters for both the French company that attempted to build a canal and the American Canal Commission, which oversaw the construction of the current Canal. Next door is the impressively white Palacio Muncipal, which was built in 1910 to house the country's legislature. The city council now meets there. It also houses a small historical museum. Our guide now took us down a narrow street past the Casa Gongora. Built in 1760, it is the last example of domestic colonial architecture in Casco Viejo. It is now used as a cultural center. We proceeded onward to the ruins of the Iglessia de Santa Domingo. This 1678 church burnt down for the second time in 1756 and was not rebuilt. However, the flat arch that once supported the choir remained. According to local lore, the longevity of the Arco Chato indicated that there were few earthquakes in Panama and that convinced the Americans to build their Canal in Panama rather than Nicaragua. The arch finally collapsed in 2003 and the one you see today is a restoration. The next landmark on our itinerary was the Palacio Nacional de Gobiero y Justica. This neoclassical building was constructed in 1898 along with the neighboring National Theater on the site of an 18th century monastery. The Theater underwent a major restoration in 2004. Rounding to the other side of the National Theater, we passed two churches. Small but ornate, the Iglesia y Convento de San Francisco de Asías was built in the 1600s but was nearly destroyed by fire twice in the 18th century. It was restored in 1998. On the other side of the street is the Iglesia San Felipe de Neri, one of the oldest churches in Casco Viejo. Nearby is Plaza Bolivar. Named after the 19th century revolutionary Simon Bolivar, the plaza is dominated by a large monument dedicated to him. This pretty plaza has an actual connection to Bolivar inasmuch as he convened a congress here in 1826 to discuss the unification of Columbia, Mexico and Central America. This ended our walk through Casco Viejo. It was interesting in that it gave a taste of the old colonial part of the city. However, it was disappointing in that no time was allocated to go inside the various landmarks that we walked past. Before going back to the ship, the bus drove along the Amador Causeway which connects three islands by the Pacific entrance to the Canal to the mainland. This gave us a view of the Bridge of the Americas, which spans the Canal, and the Biomuseo, a brightly colored, abstract structure, which houses a new museum that explores Panama's biodiversity. This was followed by a shopping stop at a rather crowded modern marina complex - - time which could have been better spent in Casco Vejo as there were attractions that we did not see such as the Iglessia de San Jose with its golden altar. After an hour or so drive back along the motorway, the tour ended at the Home Port cruise terminal in Colon.